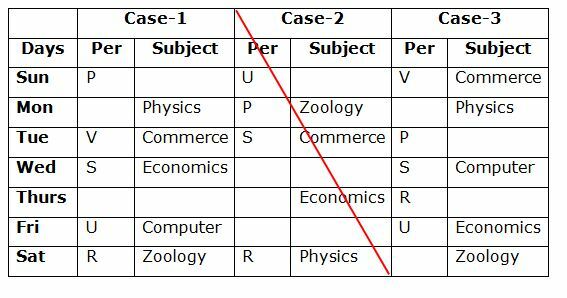 Seven persons P, Q, R, S, T, U and V attend the seminar on seven different subjects viz., Physics, Commerce, Zoology, Botany, Computer, Chemistry and Economics in seven different days of the same week starts from Sunday to Saturday but not necessary in the same order. Two persons attend the seminars between P and the one who attends the seminar on Economics. P attends the seminar on one of the days before Wednesday.Three persons attend the seminar between R and the one who attends the Commerce seminar, who attends one of the days before R. P does not attend Commerce and Physics seminars. R neither attends the seminar in Friday nor attends the Economics seminar.As many persons attend the seminar before U is same as the persons attend the seminar after the one who attends the Physics seminar. The one who attends the Zoology seminar immediately after U, who does not attend the Physics seminar. Only one person attends the seminar between U and S.Only two persons attend the seminar between V and the one who attends Computer seminar, who attends the seminar after V. V does not attend the Physics seminar.As many persons sitting between V and the one who attends Botany seminar is same as between T and the one who attends Computer seminar. 1. 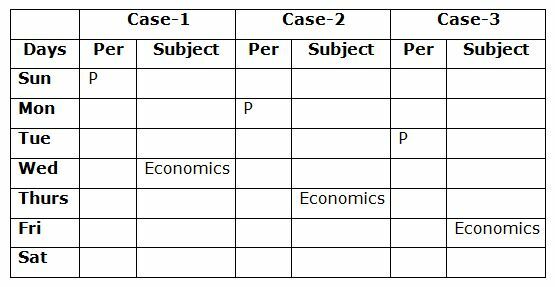 R attends which of the following seminars? Two persons attend the seminars between P and the one who attends the seminar on Economics. P attends the seminar on one of the days before Wednesday. Three persons attend the seminar between R and the one who attends the Commerce seminar, who attends one of the days before R. P does not attend Commerce and Physics seminars. R neither attends the seminar in Friday nor attends the Economics seminar. P does not attend Commerce and Physics seminars. As many persons attend the seminar before U is same as the persons attend the seminar after the one who attends the Physics seminar. The one who attends the Zoology seminar immediately after U, who does not attend the Physics seminar. Only one person attends the seminar between U and S.
Only two persons attend the seminar between V and the one who attends Computer seminar, who attends the seminar after V. V does not attend the Physics seminar. 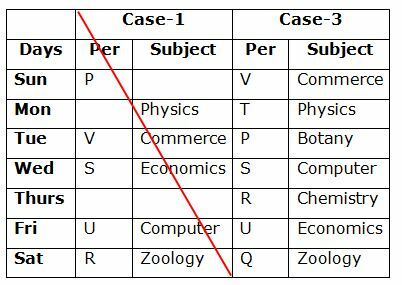 As many persons sitting between V and the one who attends Botany seminar is same as between T and the one who attends Computer seminar. So, Case-1 will be dropped. 2. On which of the following days the Zoology seminar was held? 3. How many persons attend the seminars between U and the one who attends Physics seminar? 4. If P is related to Chemistry and Q is related to Commerce in a certain way. Then, R is related to which of the following? ‘Indicative aircraft achieve’ is coded as ‘19BQ 4FG 4JC’. 6. Which of the following word represents the following ‘15EM 1JD’? 7. How is ‘performance solution’ written in this code language? 8. Which of the following word represents the following ‘2JN’? 9. How is ‘momentum ticket’ written in this code language? 10. How is ‘encourage people’ written in this code language? 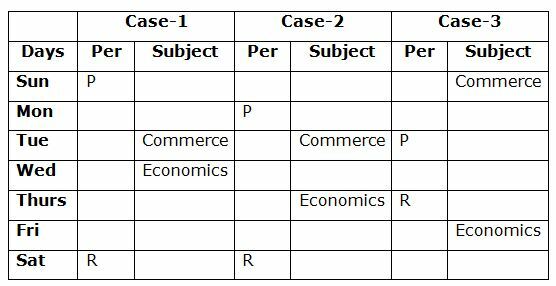 1) R attends which of the following seminars? 2) On which of the following days the Zoology seminar was held? 3) How many persons attend the seminars between U and the one who attends Physics seminar? 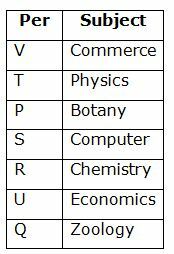 4) If P is related to Chemistry and Q is related to Commerce in a certain way. Then, R is related to which of the following? 6) Which of the following word represents the following ‘15EM 1JD’? 7) How is ‘performance solution’ written in this code language? 8) Which of the following word represents the following ‘2JN’? 9) How is ‘momentum ticket’ written in this code language? 10) How is ‘encourage people’ written in this code language?